The majority of Mrs. Cooney's work day is spent in 1st Grade working with Mrs. Herber and the many wonderful students in the class. Mrs. Cooney also teaches art to the 4th Grade and assists Ms. Baduria in the 4th Grade two afternoons a week. In addition to her classroom duties, Mrs. Cooney has been involved with the Gateway to Art program since 2005. In 2005, she became the GTA docent in her son's Kindergarten class. What started out as a fun way to earn service hours quickly became a passion. In 2007, she became the Co-Director of the GTA program and has been Visitation's Co-Director and Director since then. Teaching art to children is incredibly rewarding for Mrs. Cooney and is something she has continued to be a part of. Additionally, Mrs. Cooney's interests go beyond art and teaching; she has always had a true love for sports and is one of the girls C-Team Volleyball Coaches. Mrs. Cooney has been a part of the Visitation community for many years. 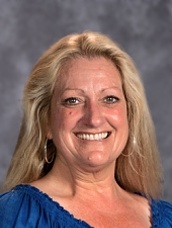 In 2008, her youngest child started Kindergarten here and throughout all of the years her children have been here, she has remained an active member of the PFA, and served on several Gala and Las Vegas Night committees and numerous fundraising events. She is especially proud of planning and orchestrating Gateway to Art's biggest fundraiser, Shake, Rattle & Bowl. Mrs. Cooney's passion for teaching and working with children was instilled in her by her mother, a retired special education teacher of 37 years. Mrs. Cooney's professional background includes work in the film industry, followed by a 20 year career in the medical field as a patient coordinator and billing manager for a prosthetics and orthotics company. After increased volunteer time at Visitation, Mrs. Cooney began working part-time as a 3rd Grade instructional aide and has been with us ever since!